Free parking on the street (three hours limit until 5:00PM). After 5:00PM, Free parking on the street and in the city parking lot, next to the restaurant on Michigan avenue. Full or Drop off catering available for any occasion. Private room for up to 30 people. Don Quijote Restaurant, the heart of Spain in the heart of Valparaiso. We have been ahead of the "Tapas" trend for the last 26 years!! Serving Spanish cuisine since 1985 and featuring over two dozen different tapas, including, Octopus, Galician style meat pastries and the traditional "Tortilla Española", Spanish potato omelet. 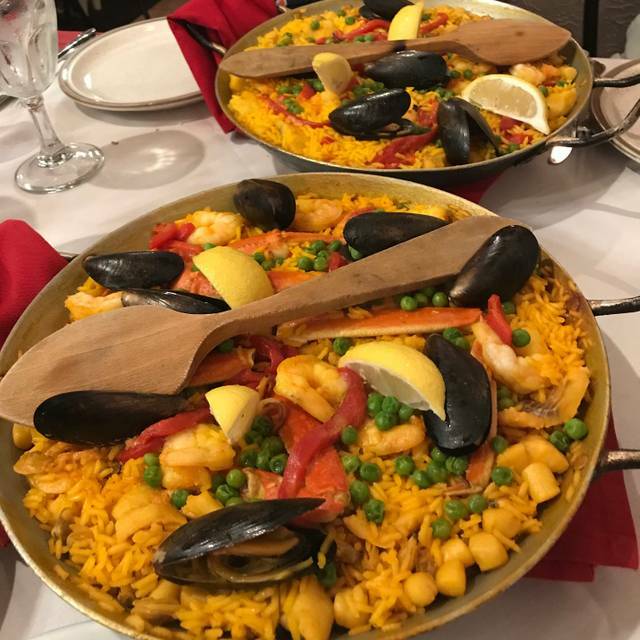 Our menu doesn"t stop there,but goes on to feature an array of tantalizing entrees, from fresh seafood, like Swordfish and Salmon to succulent Castilian style roast Lamb. The food is sure to please and fortify any traveler who might be roming the countryside. The National dish of Spain is the Paella, and we offer four different versions: Marinera, Vegetarian, Black and Valenciana. Delicious Homemade desserts round out our extensive menu. Our decor, complete with street lamps an a fountain, will transport you, to any out door cafe in Spain. galician meat pastry made with peppers, tomatoes, onions and chicken. spanish style omelette made with potatoes, onions and eggs. creamed chicken dipped in egg and bread crumbs then deep fried. tender, tasty shrimp sauteed with garlic. jumbo shrimp grilled in the shell. jumbo shrimp in the shell rioja style (sauteed with garlic in a white wine sauce). squid sauteed with onion, garlic and herbs, then simmered in its own ink. galician style octopus with paprika and olive oil. uniquely delicious spanish style meatballs. moorish style skewered pork marinated in wine, paprika, oregano, parsley, garlic and olive oil. chicken livers sauteed with onions, garlic and herbs in a delicious sherry sauce. fresh mushrooms sauteed with garlic. grilled fresh mushrooms with garlic and olive oil. sauteed artichokes with cured spanish ham. fresh cauliflower sauteed with garlic, paprika and roasted red peppers. potatoes in a creamy garlic sauce. potatoes in a spicy tomato sauce. tortilla,albóndigas,champiñones al ajillo, chorizo and patatas bravas. This was our second time dining here. This restaurant is amazing. The food is excellent. The owners and staff are friendly, knowledgeable, and courteous. The live music is a nice treat, and it's not too loud. We were seated right near the stage and could converse just fine without raising our voices. Both our times here have been very enjoyable. The prices are very reasonable for the amount of food and extras they give you. Also, the desserts are amazing. Definitely will be going back again and again. The was our first time here. Staff was welcoming and very attentive. We ordered the crab cakes and calamari appetizers. The were delish! When they brought out bread and a homemade potato veg side dish complimentary, we were over the moon! The fried cod and baked seafood stew were fantastic. We couldn’t have been more pleased. When next in town to visit our son at Valpo U, we will make it a point to come back! App wouldn't let me edit Noise level selection. The noise was low. Musicians that aged that evening were great. We always love going here. Don Carlos and his wife are always pleasant and happy to see us. The food was amazing! It was my husband's first time eating there and Elaina went over the menu with him thoroughly. He loved it as much as I do and we will be back again and again. We came to Don Quixote for a nice dinner before going to downtown theatre. Service was wonderful, had a great bottle of wine but food was mediocre. Hostess/owner was so nice...we told her we were going to the show and she told us to have a good time. Imagine our surprise when we got to the show, opened the playbill and there was a full page ad from Don Q. for 30% off your dinner when you show your theatre ticket???!!!! Wow. Nice quaint setting with very attentive staff. The desert and port wine provided after the meal was a big surprise. The overall bill for the meal and the level of service was well worth it. Always a great experience both in dining, service and atmosphere. Wide selection of wines, food, with very friendly helpful servers. Be sure to get the Tapas. We had the Combo. Everything was delicious! The food was great had the seafood paella wonderful. The desserts were delicious too. Chocolate hazelnut cheesecake mmmmm good. From start to finish everything was delicious! Service was terrific too! A truly perfect meal. The service was wonderful as well. The meal began with a complimentary salad and bread. We ordered a Spanish Syrah. It was terrific and affordable. We got a combination appetizer which tasted great and was a generous portion of sausage, potatoes, torte, mushrooms and meatballs. The paiella for two was FULL of fish, mussels, shrimp, crab and more. The portion for two could serve four! Dessert was followed by complimentary port. Two servers plus both owners came to our table. The singer/guitarist even played Happy Bday for my wife. Can't say enough about how great the night was in every aspect. Everything cooked in olive oil! Good but not what we expected. We have been going to Quixote's for a number of years and I would say the food has always been excellent but has improved over time. It's probably the best place in the area to get reliably good seafood, but of course many other options are available. Carlos and Elena are the most hospitable restaurateurs we have ever met, they are friendly and care about their customers, kids and adults. Highly recommended. A lovely experience! Lighting was just right; it is a quiet atmosphere, family-friendly with soft music in the background. Decor is lovely and welcoming. We were greeted warmly by the owner, and wait staff was knowledgeable attentive and friendly. Food was excellent! Knowledgeable wait staff was able to help us with selections . We will definitely be back. One of our favorite restaurants in the whole world. Food is great, wine was fantastic, service second to none. We'll be back. Carlos is an amazing host ... the best Port at the end of your meal and always stops by your table to say hello. Food is authentic and amazing ! Absolutely fantastic! The food was perfect, good wine list too. The live music was a good touch, very soothing. The service was friendly and authentic, but they also left us alone to enjoy our evening. They were not annoying at all like most restaurants. Highly recommended, I can't wait to go back. This place never disappoints. Food is always prepared fresh and to order. Service is excellent. Desserts are well worth trying. The blackened red fish is excellent and cooked to perfection. Crab cakes are very good and not all filler. Delicious Spanish cuisine combined with by far the best, most friendly customer service! Impeccable service, special ambiance, and delicious food! We have a young lady from Spain staying with us as an exchange student who was missing authentic food from Spain. We saw the billboard and made plans to travel and pay them a visit. The ambiance and food did not disappoint. Our server was a bit curt and made us feel rushed, but the owners both made it a point to come out and check in on us, welcome our student to their restaurant and converse with her about goings on in Spain. There is a small shop which sells authentic Spanish groceries, olive oil, etc. The tapas were delicious and perfect for casual dining. This restaurant also featured live music which made the atmosphere special. We would definitely recommend. We had a wonderful time. The owners greet you and make you feel very welcome. You feel like you are a part of their family. The food and ambiance at this restaurant were fantastic. What made the restaurant very special was the friendly attention given to us by both owners of the restaurant. The wife greeted us at the door, took our coats and umbrellas and hung them up, and seated us at the table. The husband, who is also the chef, came to our table 3 times, once to help choose wine to go with the dinner, once to ask how we liked everything, and once to bring us complimentary dessert and port. The most amazing thing about this couple is that they searched through their entire load of linen to find the handkerchief that I had left there, and then mailed it to me. The service and hospitality that we received tonight was nothing short of amazing. This was our first visit, but will absolutely not our last. We were visiting our son here in valpo and celebrating his birthday. They made the night a memorable experience for all of us. I own and operate 5 restaurants back home, so please take it from my honest opinion that these people are kind wonderful people that deserve as much success as they can receive. Oh, did I forget to mention the food was outstanding! Thank you again for a wonderful evening. I loved it. The owners were amazing. They made you feel like you've known them for years. I will definitely be back. First time at Don Quijote and I've visited many Spanish/Iberian style restaurant and we were VERY pleased with the attention and service we received. The food was really good! I would highly recommend visiting this great restaurant. We traveled an hour and a half to try this place and were very pleased with the result. Absolutely OUTSTANDING!!!!!! Everything we ordered was terrific. Worth the 1 1/2 drive. Will come back again and again and again. Excellent, we enjoyed our experience a lot. We will do it again. we love the ambiance and the hosts of this special place. a true taste of Spain right here in our hometown. Very authentic food and attentive chefs! Every single item from the appetizers, the paella, sangria and dessert were absolutely fantastic! Excellent food! Greatest challenge s deciding what to order. I’d suggest makng a choice, commit to it, and then order an assortnent of tapas to share! If you are lucky, you will be there on a Friday evening when Carolyn and Pancho are gracing you with their vocal and guitar talent! We went out of our way to make Valpo our overnight stop on a two-day trip so that we could enjoy dinner at Don Quijote’s—and enjoy it we did! Wonderful tapas, paella, wine, and warm, friendly service. We will come back again. Very good food, all made in-house. Authentic Spanish cuisine (and here I mean from the Iberian peninsula) The prices are reasonable. Excellent service. This is one of our favorites when ever we are near Valparaiso. This is the real deal. The food, music, decor and service at spot on. You always know you in for a treat when the owners greet you the moment you step in and make sure everything is just right. Traditional Spanish food choices, tapas, seafood, steaks, homemade sangria and port! Desserts that cover a wide range. This is a place for lunch dinner, special occasions or just a great meal. Do not miss this treasure from Spain! Was a really good dinner at clearly a family-run restaurant. Service was really good and owner made sure of it. Will be dining there next time we're in town! I feel like I'm back in Madrid when I eat at Don Quijote's Spanish Restaurant. I can't visit NW Indiana without eating here. The food is amazing, and Carlos and Maria are wonderful, caring hosts.